When you stay at this condo in Tulum, you'll be near the beach, within a 15-minute drive of Tulum Mayan Ruins and Tulum National Park. Featured amenities include laundry facilities and a safe deposit box at the front desk. A roundtrip airport shuttle is provided for a surcharge (available 24 hours), and free self parking is available onsite. 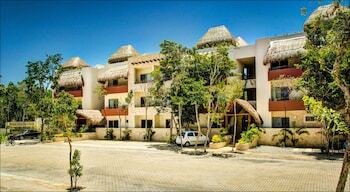 When you stay at Mayan Village Resort in El Pescadero, you'll be on the waterfront and steps from Los Cerritos Beach. Free self parking is available onsite. With a stay at Departamento Inglaterra 4 in Guadalajara, you'll be within a 10-minute drive of La Minerva and Expo Guadalajara. Free self parking is available onsite.